Hardly a day goes by without hearing some fearsome warning about the next possible viral epidemic that could kill us all. The newest threats to life as we know it are Ebola in West Africa and Zika in the Americas. Zika viral infection might cause microcephaly and women should avoid travel in dangerous areas. So far, one person has died of Zika. Doctors are scrambling to find the right vaccine and new drugs to kill the virus. Scary stuff indeed. But what about the 5000 people who die every day in America of heart disease, cancer and diabetes? 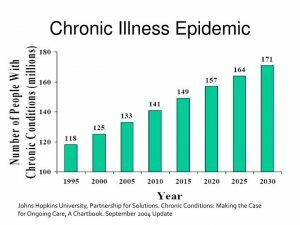 You would think that doctors should be also scrambling to find effective treatments for epidemic of chronic disease which afflicts over 50% of Americans as well, or, is this just business as usual for the medical profession? I am not saying that we should dismiss infectious disease surveillance. Certainly, history has taught us deadly lessons about a rapidly spreading infection. Millions have died due to a microbe ravaging through a vulnerable population. The Bubonic Plague, or Black Death, carried by rats and fleas killed millions in 14th century Europe. In the 1500s Europeans visitors brought smallpox to the Americas and over 70 million Native Americans died. The Great Influenza Pandemic (H1N1 Asian flu virus) killed over 100 million people globally and 675,000 Americas. In the early 1950s polio virus killed 3,145 people and left many more paralyzed. But times have changed. We have learned about clean water, food production, sewage control and a long list of social hygiene tools have changed the landscape of diseases afflicting mankind. The new epidemic is chronic disease, including heart disease, cancer, stroke, diabetes, obesity, to mention a few, and we cannot blame a virus or bacterium. We are the cause – what we eat, how much we worry and create stress for ourselves, how much exercise we can fit into our busy and dizzy days. These modern epidemics did not burst out in weeks or months like the infectious epidemics of old. They crept up on us while we weren’t watching, but they are no less deadly. Almost 5000 Americans die daily from chronic diseases. That is equivalent to 14 jumbo jets crashing in one day. Do you think we would notice that? But people are dying from heart attacks, strokes, cancer, and diabetes in hospitals, ERs, nursing home, and private homes throughout our country every day and it has faded into the background of the tapestry of modern life. It is a normal day. The drug industry offers more symptomatic medications which doctors peddle in 10-minute office visits and the plague goes on. about 50% of all adults—117 million people—had one or more chronic health conditions. 25% had two or more chronic health conditions. Heart disease and cancer—together accounted for nearly 48% of all deaths. Chronic diseases such as heart disease, diabetes, cancer, and high blood pressure afflict about 200 million Americans and account for 75% of the $2.2 trillion spent on health care in America. How are we handling this epidemic that no one wants to talk about? You guessed it – taking more drugs. According to research at the Mayo Clinic, published in 2013 in the Mayo Clinic Proceedings. This is great for the so-called “health industry”, the most profitable industry in the world booked a whopping $24.4 billion in combined 2014 revenue, but not so good for patients. More aptly called the “disease industry”, this powerful economic force provides us with more drugs and better surgical methods. All the while the chronic disease epidemic is getting worse. The American people are accustomed to technology making our lives easier. After all, antibiotics are wonder drugs and we see medical science offering new discoveries again and again. 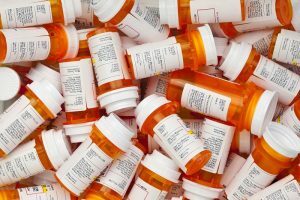 We have become dependent, perhaps addicted, to the medical profession and the prescription pad to fix us quickly. Unfortunately, since chronic illness such as heart disease, diabetes, hypertension, depression and many more, do not reverse with symptom relieving therapies, we need to take back the responsibility for our health and develop confidence in the powerful healing wisdom innately built into your body as standard equipment. Your doctor has nowhere near the power or knowledge for healing as you do. Your body is a healing machine and the disease is the invitation to restore health and wellbeing in your life using the tools of mindbody medicine. I am talking about functional, or, integrative medicine and the power of consciousness. More about this later.